Western blot analysis of extracts from HeLa cells, mock transfected (-) or transfected with SignalSilence® ATF-2 siRNA #6443 (+), using ATF-2 (D4L2X) XP® Rabbit mAb (upper) or β-Actin (D6A8) Rabbit mAb #8457 (lower). 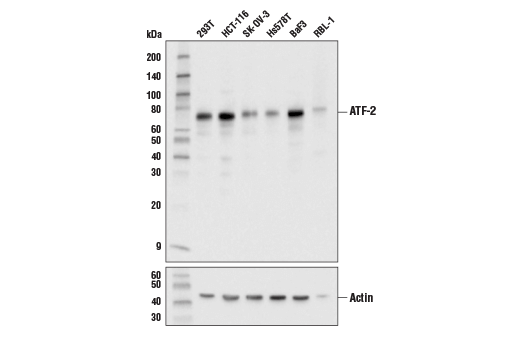 Western blot analysis of extracts from various cell lines using ATF-2 (D4L2X) XP® Rabbit mAb (upper) or β-Actin (D6A8) Rabbit mAb #8457 (lower). 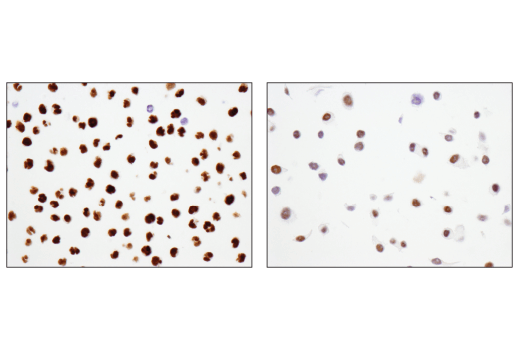 Immunohistochemical analysis of paraffin-embedded Molt-4 cell pellet (left, high) or SKBR3 cell pellet (right, low) using ATF-2 (D4L2X) XP® Rabbit mAb. 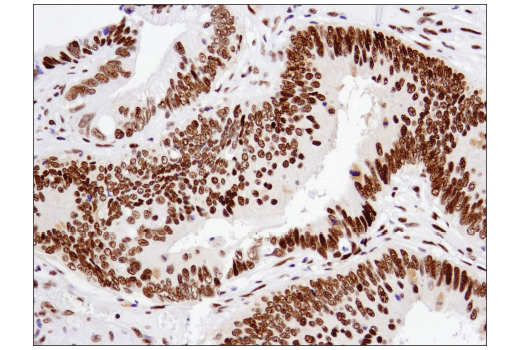 Immunohistochemical analysis of paraffin-embedded human colon carcinoma using ATF-2 (D4L2X) XP® Rabbit mAb. 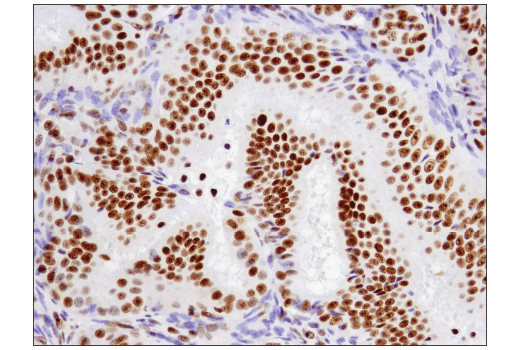 Immunohistochemical analysis of paraffin-embedded human endometrioid adenocarcinoma using ATF-2 (D4L2X) XP® Rabbit mAb. 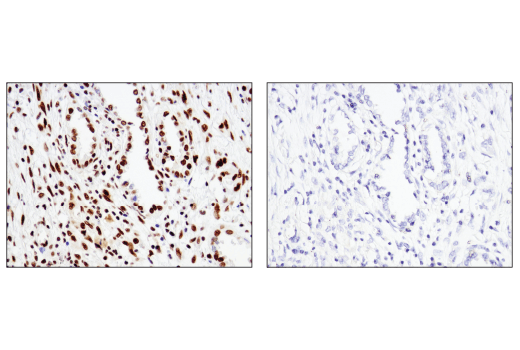 Immunohistochemical analysis of paraffin-embedded human lung carcinoma using ATF-2 (D4L2X) XP® Rabbit mAb in the presence of control peptide (left) or antigen-specific peptide (right). 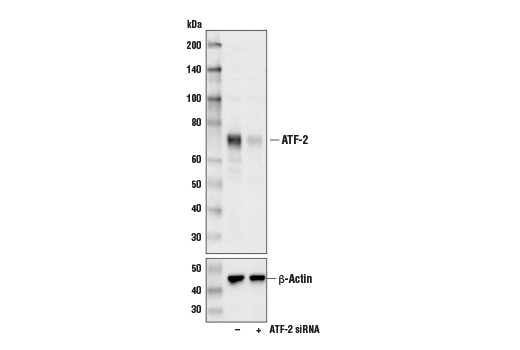 Chromatin immunoprecipitations were performed with cross-linked chromatin from Jurkat cells treated with TPA #4174 (50 ng/ml) and Ionomycin #9995 (200 ng/ml) for 30 min and either ATF-2 (D4L2X) XP® Rabbit mAb or Normal Rabbit IgG #2729 using SimpleChIP® Plus Enzymatic Chromatin IP Kit (Magnetic Beads) #9005. The enriched DNA was quantified by real-time PCR using SimpleChIP® Human c-Fos Promoter Primers #4663, human TNF alpha promoter primers, and SimpleChIP® Human α Satellite Repeat Primers #4486. The amount of immunoprecipitated DNA in each sample is represented as signal relative to the total amount of input chromatin, which is equivalent to one. 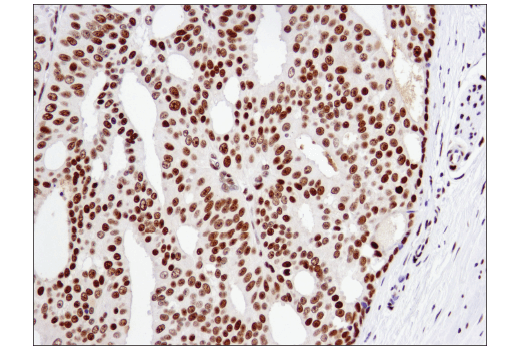 Immunohistochemical analysis of paraffin-embedded human prostate carcinoma using ATF-2 (D4L2X) XP® Rabbit mAb. For optimal ChIP results, use 10 μl of antibody and 10 μg of chromatin (approximately 4 x 106 cells) per IP. This antibody has been validated using SimpleChIP® Enzymatic Chromatin IP Kits. 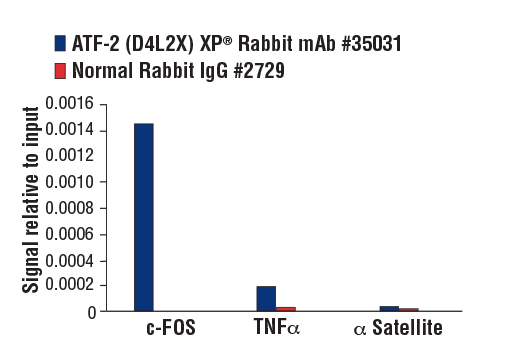 ATF-2 (D4L2X) XP® Rabbit mAb recognizes endogenous levels of total ATF-2 protein. Monoclonal antibody is produced by immunizing animals with a synthetic peptide corresponding to residues surrounding Gln170 of human ATF-2 protein.